For other uses, see Incantation (disambiguation). An incantation, or a spell, is a magical formula intended to trigger a magical effect on a person or objects. The formula can be spoken, sung or chanted. An incantation can also be performed during ceremonial rituals or prayers. Other words synonymous with incantation is spells, charms or to bewitch. In the world of magic, the incantations are said to be performed by wizards, witches and fairies. In medieval literature, folklore, fairy tales and modern fantasy fiction, enchantments are charms or spells. This has led to the terms "enchanter" and "enchantress" for those who use enchantments. The term was loaned into English around AD 1300. The corresponding native English term being "galdr" "song, spell". The weakened sense "delight" (compare the same development of "charm") is modern, first attested in 1593 (OED). Any word can be an incantation as long as the words are spoken with inflection and emphasis on the words being said. The tone and rhyme of how you speak the words matter on the outcome of the magical effect. The tone, rhyme, and placement of words used in the formula matters in influencing the outcome of the magical effect. The person who is speaking magical words usually commands for the magic to be carried out. The incantation performed can bring up powerful emotions and remind one of a sense of awe in childhood. 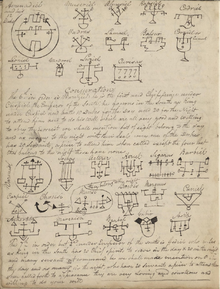 Surviving written records of historical magic spells were largely obliterated in many cultures by the success of the major monotheistic religions, Hinduism, Islam, Judaism, and Christianity, which label some magical activity as immoral or associated with evil. The Latin incantare, which means 'to utter an incantation', or cast a magic spell, forms the basis of the word "enchant", with deep linguistic roots going back to the Proto-Indo-European kan- prefix. So it can be said that an enchanter or enchantress casts magic spells, or utters incantations, similar to what are called Mantra in Sanskrit. The words that are similar to incantations such as enchantment, charms and spells are the effects of reciting an incantation. To be enchanted is to be under the influence of an enchantment, usually thought to be caused by charms or spells. Magic words or words of power are words which have a specific, and sometimes unintended, effect. They are often nonsense phrases used in fantasy fiction or by stage prestidigitators. Frequently such words are presented as being part of a divine, adamic, or other secret or empowered language. Certain comic book heroes use magic words to activate their powers. 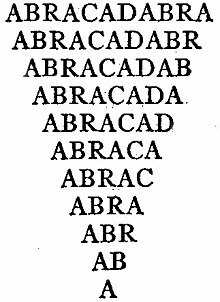 Examples of traditional magic words include Abracadabra, Hocus pocus, Open sesame and Sim Sala Bim. In Babylonian, incantations can be used in rituals to burn images of one's own enemies. An example would be found in the series of Mesopotamian incantations of Surpu and Maqlu. In the Orient, the charming of snakes have been used in incantations of the past and still used today. A person using an incantation would entice the snake out of its hiding place in order to get rid of them. In Jewish rites reciting a bible verse, a person has to follow strict Jewish rules. The performer of an incantation has to prepare three days ahead of time with fasting, praying and studying. The Jewish law requires that incantations only be recited during the new or full moon, before sunset, and during the Sabbath. The Jewish commentary, the Talmud mentions that incantations are to be in the name of the mother. An incantation of a bible quotation attached to a charm or object is often recited backward and frontwards. Incantations are often seen in demonic activity where the devil uses words to bring misfortune or sickness to someone. Some illnesses include mental illness or anxiety. The aspect of the devil in incantations is feared by many. The demons can create horrible events such as divorce, loss of property, or other catastrophes. In traditional fairy tales sometimes magical formulas are attached to an object and when spoken can help transform the object into the imaginable from the unimaginable. In these stories, often incantations are attached to a magic wand used by wizards, witches and fairy-god mothers. A widely known example is the spell that Cinderella's Fairy Godmother used to turn a pumpkin into a coach. Incantations often nonsense or whimsical rhymes are performed. You can listen to a Babylonian incantation being read aloud by a modern scholar. (It is possible to view a translation and transcription while listening). Mesopotamian incantations were composed to counter anything from witchcraft (Maqlû) to field pests (Zu-buru-dabbeda). ^ a b Cushman, Stephen (2012). Princeton Encyclopedia of Poetry and Poetics : Fourth Edition. Princeton, ProQuest Ebook Central,: Princeton University Press. p. 681. ^ Conley, Craig (2008). Magic Words, A Dictionary. San Francisco: Weiser Books. p. 40. ISBN 978-1-57863-434-7. ^ Conley, Craig (2008). Magic Words:a dictionary. San Francisco: Weiser Books. pp. 23–27. ISBN 978-1-57863-434-7. ^ Davies, Owen (8 April 2009). "The top 10 grimoires". The Guardian. Retrieved 24 October 2017. ^ Brantly, Susan (2009). The Nordic Storyteller : Essays in Honour of Niels Ingwersen. ProQuest Ebook Central,: Cambridge Scholars Publishing. ^ Markham, Geller (2015). Healing Magic and Evil Demons : Canonical Udug-Hul Incantations,. ProQuest Ebook Central, https://ebookcentral-: De Gruyter, Inc. pp. 3–5. ^ Garry, Jane (2005). Archetypes and Motifs in Folklore and Literature. Armonk: M.E. Sharp. p. 162. ISBN 0-7656-1260-7. ^ a b c Malinowski, Bronislaw (2013). Coral Gardens and Their Magic: A Study of the Methods of Tilling the Soil and of Agricultural Rites in the Trobriand Islands. Hoboken, New Jersey: Taylor & Francis. ISBN 1136417737. ^ a b c d e f g h Tambiah, S. J. (June 1968). "The Magical Power of Words". Man. 3 (2). doi:10.2307/2798500. JSTOR 2798500. ^ "The Recordings: BAPLAR: SOAS". speechisfire.com.